The chemical liquid is environmental type, non-toxic, odourless, non-pollution, long kept liquid also can be reused. The chemical liquid solution consumes very low cost. The machine designs for effectively prevent the film surface drawing scrape lines, wrinkling, shrinkage, with fast drying capacity, good rewinding design. 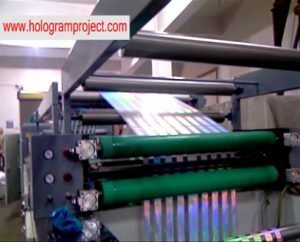 There are cleaning quality observation screen, the partially transparent window can return the true nature colour of the film. Coating Tray : Must be from stainless steel [2 dimension for each type: 350 mm and 700 mm (depends on maximum width). Coating Adhesive Reservoir : We will provide 2 types: one planar for common adhesives; and one conical with separate reservoir for adhesives, which have tendency to sedimentation. Demetalised Station : 1 Nos. Type of Coating & Material. Substrate to be used. : PET, CPP, PVC, Polycarbonate Thickness 12 to 50 Micron etc. 2 Nos. Web Guiding at Unwind Station is done automatically through web Guide. This is Pneumo hydraulic web guiding system. Auto Tension Controller with Load Cell Feedback with 5 KG Powder Break for Primary Unwinder. Control panel box is provided on this station which comprises of suitable push buttons for machine operations. Heavy robust frames solid plates 50 mm thick all over precisely machined for accuracy. Doctor blade can be adjusted by rotating it. Horizontal fine adjustment is done by two knobs. The Pressure Roll is Pneumatically operated and it is fitted with one set of Hollow type Rubber Roll. Coating Tray assembly is adjustable type. It can move up & down to accommodate wide range of cylinder dia. Chamber is divided in Five zones. There is air Nozzles provided on each guiding roll in the chamber. All chamber rollers are driven. These are steel Hard Chrome Plated & dynamically balanced. There will be centering Rewinding Type of arrangement provided with lay on Roll assembly. Automatic Tension with Load Cell Feed Back with 5 H.P Motor with AC Drive. All civil work like Foundation grouting etc.